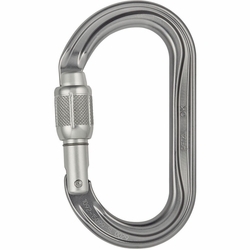 Petzl OK Carabiner. Lightweight aluminum carabiner with a symmetrical oval shape that allows optimal loading of devices with a wide section, such as pulleys, ascenders and progress capture pulleys. TRIACT-LOCK: automatic locking system designed for frequent manipulation. Triple-action opening by raising and turning the sleeve, then pressing on the gate. BALL-LOCK: automatic locking system designed for frequent manipulation, with lock indicator. Triple-action opening by pressing on the green indicator, turning the sleeve, then pressing on the gate. The green button indicates when the gate is locked.